Heather Lang is the online managing editor for The Literary Review, co-editor of Petite Hound Press, and an adjunct professor. She is a recent graduate from Fairleigh Dickinson University’s low-residency MFA in Creative Writing program, and her chapbook manuscript, Common Prayers, was named a semifinalist in the 2014 Tupelo Press Snowbound Chapbook Award competition. Her poetry has been nominated for a Pushcart Prize and has been published by or is forthcoming in december, Jelly Bucket, Mead, Watershed Review, and others, and she has reviewed for Atticus Review and HTMLGIANT, among others. Look at how the lines break around the subject of this poem and how the couplets illuminate the nature of this couple’s difficult year. 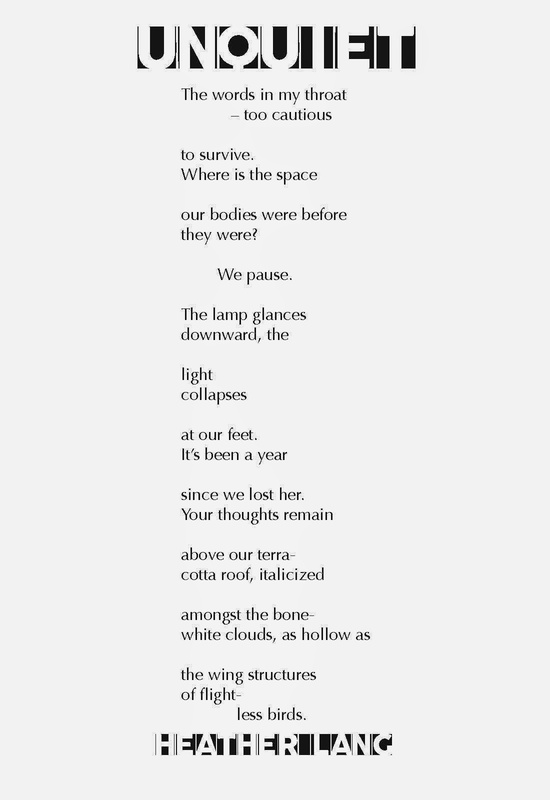 “to survive./ Where is the space” functions as its own question, separate from the rest of the thought. The two lines that follow work in the same, separate way. These fragments of the poem’s central question are also fragments of the existential crisis embedded in the poem, where we can feel the hurt before we even know “It’s been a year/ since we lost her.” Lang then takes it one step further, breaking individual words across the ends of lines to underscore the broken state of her subjects. It’s especially effective in the closing lines where wings and flight are separated from the life of actual birds. The emptiness that surrounds the two people in this poem is so heavy. The typeface had to reflect that weight as well as its effect. Radical Block hems in its letterforms with solid ink, making the title look as much like a slash as a word. For the body, though, greater legibility was needed. Optima’s strong vertical strokes hold their own against Radical Block and yet also feel delicate, like a bird’s wing.